Cabo San Lucas, or Los Cabos as the locals call it, has exactly two things going for it. The first is a long, wide beach. The second is a deep bay, suitable for parking cruise ships. There is sun, I suppose, but when the temperature hits ninety-five degrees at ten o’clock on a June morning, I do not call this an advantage. Let me clarify a few things here. I’m not a heavy drinker. I don’t enjoy shopping, except perhaps for books. I know myself well enough to stay out of bodies of water larger than a hot tub. 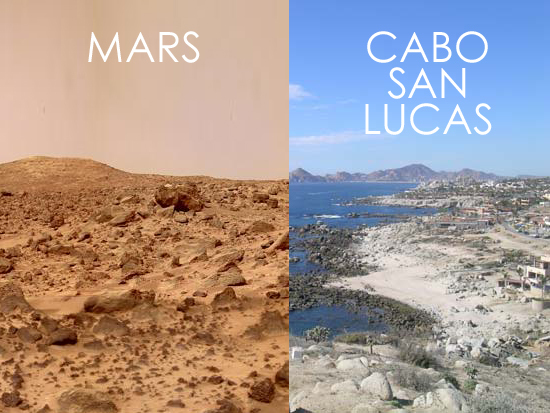 So perhaps Cabo San Lucas was not the best choice of vacation destinations. But it was the first port of call on my first ever cruise, so my family and I (forgetting the advice of Apocalypse Now) decided to get off the boat and head for the beach that had looked so inviting framed in our stateroom window. Manmade structures aside, Cabo has the most barren landscape I have ever seen. I’ve lived nearly all of my life in Southern California, and I visit Anza Borrego regularly, so I thought I knew what barren was. But scrub, cholla, and the gangly Ocotillo grow in the high desert. There are bugs, snakes, kangaroo rats, and the occasional roadrunner. Flowers bloom in the springtime. Los Cabos is rock, bare lifeless rock, jutting out into ocean at the end of the Baja peninsula. Except for the water and the intensity of the sun, it could pass for the surface of Mars. Presuming, that is, if someone decided to build a resort there. Exploring Cabo on foot felt disconcertingly like wandering Downtown Disney. There was the same attempt to give the blocks a naturalistic, residential feel, despite the fact that every building was either a store or a restaurant. On the horizon, we could see the looming upper floors of luxury hotels, both complete and under construction. Gated condo communities dotted the dead hills. That whole morning, we saw nothing that looked remotely like a place where the native population might shop or live. Commerce had entirely replaced community. We walked through an indoor mall. Apart from the air conditioning, it was just like the outside world. We had wanted to see El Arco, but our cruise director had cautioned strongly against chartering a local boat. Listening to her over the cruise ship’s PA system, I had been inclined to view this advice a bit cynically. The cruise line sold excursion packages of its own, after all. Stepping off the tender and onto the dock, however, I was forced to reconsider. A line of slovenly, unshaven, vaguely piratical looking men with cardboard signs swarmed us, pushing glass-bottom boat tours, snorkeling, jet ski rental, and parasailing. They looked and acted like aggressive panhandlers, following us down the dock, spieling a mile a minute. We decided to head for that long, wide beach. Much later, at dinner back on the ship we heard how our tablemates, who decided to parasail, had been dropped from a painful height and dragged through the water. We never made it to the beach. The tender had left us on the opposite end of town. We walked on and on in the heat, trapped in a maze of shops and bars, fending off locals selling silver-plated necklaces and gourd whistles painted to look like birds. Finally, we gave up. After a climate-controlled lunch aboard ship, my wife and I settled into sun chairs on the aft deck while the boys swam. Looking up from my book, I could see both the barren hills and that long, elusive stretch of sand. I took a sip of ice-cold apple juice and remembered Apocalypse Now.